The global steam autoclave market has oligopolistic nature due to consolidation. Some of the players operating in the steam autoclave market are 3M Healthcare, CISA Group, STERIS, Belimed Group, and Matachana Group. Additionally, Johnson & Johnson, STERIS, and Getinge Group accounted for the two-thirds share of the global market in 2015. Presence of a handful of manufacturers of the devices which have vast product portfolio is intensifying the competition among them. This intense competition has created difficulties for new entrants of new players in the market. Additionally, product innovation, the cost-effectiveness of product manufacturing, and numerous strategies adopted for business expansion could help the new entrants among the intense competition. 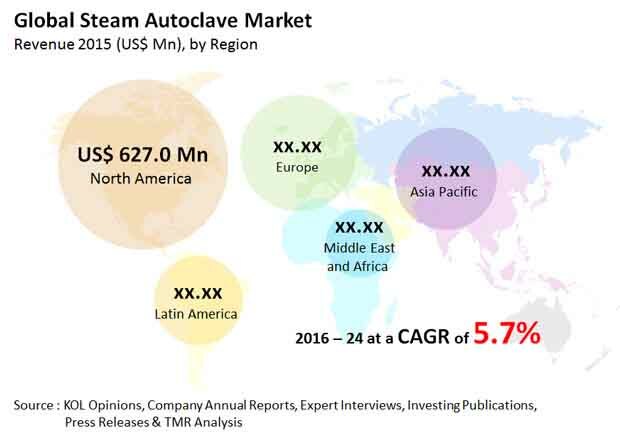 According to the report by TMR, the global steam autoclave market expects to expand with 5.7% CAGR over the forecast period from 2016 to 2024, to attain the value of US$2.57 bn by the end of 2024 from the value of US$1.57 bn in 2015. Of the product types, traditional steam autoclaves dominated the global market with a 91% market share in 2015. Region-wise, North America accounted for the 40% shares in 2015 in the global market for the steam autoclave. This growth is attributable to the increasing surgical procedures and higher adoption of steam autoclaves from hospitals in the region. The surgical procedures are increasing due to the increase in the chronic diseases and need for their treatments. The Centers for Disease Control and Prevention suggested that near about 46.5 mn surgeries and 5 mn endoscopic procedures are performed every year in the US. Additionally, the patient base is increasing especially in the developing countries in the Asia Pacific owing to the large population of the region. The aforementioned factors are propelling adoption of the steam autoclave and which is likely to boost the growth of the steam autoclaves market. The rising patient-centric approach, efforts are taken to reduce numerous side-effects and other infections such as clostridium difficile infections and nosocomial infections are propelling adoption of the steam autoclaves. Increasing prevalence of these infections is fuelling growth of the global steam autoclaves market. In addition, the introduction of technologically advanced and exceptional products which has E-beam and gamma irradiation are influencing positively on the growth of the global market for the steam autoclave. Additionally, product versatility and low cost of new products are expected to support growth of the market. The growth of the steam autoclaves market is gaining traction due to the presence of stringent regulations in order to ensure patients safety and growing presence of advanced healthcare facilities. Despite these growth prospects, the factor such as increased uptake of disposable products which are meant to be used once and required less sanitization is hampering the growth of the global steam autoclave market. In addition, higher excise duty imposed on the medical devices are impacting negatively on the growth of the overall steam autoclave market, especially in the developing regions. Nevertheless, growing awareness about health care across the developing countries is creating growth opportunities for the key players operating in the global steam autoclave market.